I wasn't kidding when I said we were going to get crazy with tinfoil! I love playing and stretching a theme for the creative juice. How many times have you looked at something and said, "oh nice," and moved on without letting it stir your creative pot? Well, since this is a blog about creativity, I want to take you on that playful journey. The one where you ask: hmmm...how can I take that a step further? Our tree uses the same techniques, just varying the patterns with the foil. 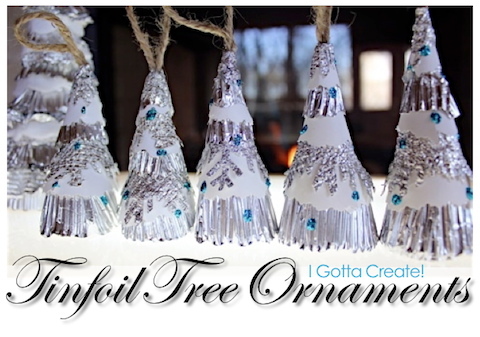 By just layering the patterns, pinching, and hot-gluing it onto your cone form, you will get this lovely silvery tree. I put a little bit of white fleece in there to look like snow. 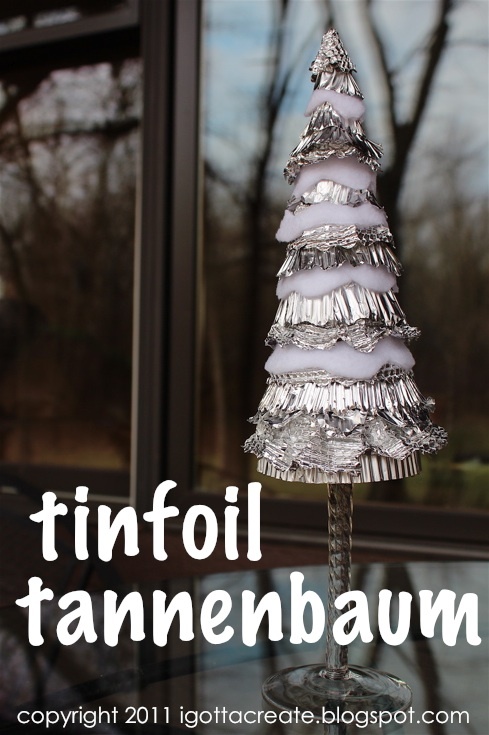 Use wavy scissors to cut the foil for more tree-like texture. I like making it 'bumpy' like a real tree. Here she is, all silver and snow! Time to put on the high heels and dress up for the Christmas party! Hmmm...I wonder: who's she going out with? Stay tuned for the mystery date! a Frosty Forest of Ornaments! 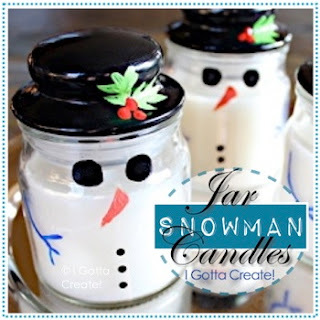 Speaking of frosty, take dollar store jar candles and turn them into the cutest little jar candle snowmen ever! What a gorgeous tree idea! A series of really small ones on the table would be totally stunning. 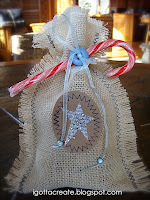 Thank-you so much for joining our Pin’Inspiration Party today. Your creativity is very much appreciated. Happy follower, would love for you to pop by to grab a button. THis is so pretty, I love it!! My gosh, this is absolutely adorable! I need to click further in this tinfoil deal, LOVE the look! And those little lights! Beautiful creation! Oh how fun to share this quirky kind of Christmas joy! Thanks for spreading the cheer, Donna! This is fantastic - so creative! Oh my gosh how stinking cute this is. What a neat idea..love the little lights too. Thanks for sharing with my newbie party. You are a wizard with the tinfoil. I need a crimper! Um, incredible. I would have never even thought to have made something like this. I just might have to get one of those crimpers. So lovely idea, have never seen one like like that, it's so cool. Thank you for sharing and have a great day!